I cannot express to you how excited I am for this Sunday and the season 4 premiere of Mad Men. Mike and I just watched all of the previous seasons about a month ago. We had been hearing how good the show was for ever and then finally sat down and watched all the episodes and we are hooked. Aside from all the amazing sets and mid century furniture, I love the fashion, Joan's pen necklace was so great I had to get one for myself and I love it, I wear it all the time. 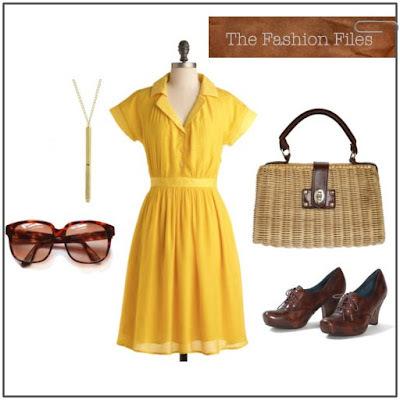 This week's Fashion File is inspired by the women of Mad Men, I put together this look inspired a little by each of the female characters on the show. I hope you enjoy!